The beverage company has lost its pop, but that doesn't mean its stock can't still bubble up. The case for Coca-Cola growth isn't black and white -- there is a lot of risk regardless of the path it pursues. Photo: Beverley Goodwin, Flickr. On the surface, Coca-Cola (NYSE:KO) continues to reel from declining soda consumption, particularly diet soda. With sparkling beverages accounting for three-quarters of Coke's annual revenue last year, global volume growth managed only a 1% increase in the first quarter thanks to six additional selling days and the inclusion of the Easter holiday. With uncertainty still bubbling up, investors are right to question whether the beverage giant's stock is still a buy. However, Coke can still leverage several important catalysts into future growth. Here are three good reasons why it might just succeed. While North America is still Coca-Cola's largest soft drinks market, representing 47% of total revenue last year, it's also one of its most mature. This continent is also where it's enduring some of the worst falloff in business. With unit case volumes coming in flat in the first quarter due to a 1% decline in sparkling beverages, the company needs to look elsewhere. Coca-Cola investors could savor bubbly returns if the beverage giant's global ambitions pan out. Photo: sarah b., Flickr. Volume growth remained robust in the Asia-Pacific region, where sparkling beverage volume rose 6%, as well as Eurasia and Africa, where it was 4% higher, but economic and political unrest in promising developing markets such as Russia and Brazil are headwinds for Coca-Cola. It also faces sluggishness in Japan and China, and currency headwinds everywhere are dragging down performance. But the company is still investing in all regions as it anticipates future growth, and productivity initiatives launched last October have Coca-Cola expecting to realize $3 billion in annualized savings by 2019. If calm and stability return to its foreign markets, the beverage giant can build on its global value share gains even during this time of upheaval. 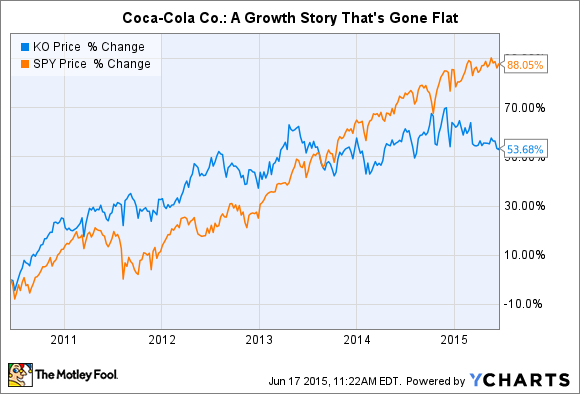 Cooperative growth also seems to be helping Coca-Cola maintain its leadership position. It just completed a previously announced strategic partnership with Monster Beverage that gives Coca-Cola a 16.7% stake in the energy drink maker. In addition to Coke becoming Monster's preferred global distribution partner, Big Red is transferring a dozen of its energy drink brands to Monster while claiming Hansen's Natural Sodas, Hansen's Juice Products, Peace Tea, and Hubert's Lemonade from its new partner. This is in addition to Coke's alliance with Keurig Green Mountain and the launch of a branded Keurig at-home cold beverage system later this year. Yet there are risks aplenty. For example, while energy drinks are a fast-growing segment of the beverage market, they're also under investigation by federal regulators due to alleged health risks. And Keurig might have hampered the rollout of its new drinks system by pricing it out of the reach of most consumers. The same people who led a mini-revolt last year against Coca-Cola's board of directors for the gold-plated compensation package handed to CEO Muhtar Kent have also been agitating for the beverage giant to initiate "transformative strategies." Wintergreen Advisers says those anticipated $3 billion in annual savings are much too conservative for a company with over $17 billion in sales, general, and administrative expenses. It criticizes management for squandering billions of dollars when it invested in Coca-Cola Enterprises' North American bottling assets, and it's none too happy with the partnerships with Monster and Keurig. Instead, it believes Coca-Cola needs a dramatic overhaul, with a new board of directors if necessary. The investor points to what H.J. Heinz engineered last year when it went private and then made a play for Kraft Foods in March. Only by doing something big like that, the argument goes, can Coca-Cola break free from its grow-slow rut. CEO Kent has called 2015 a year of transition, but it needn't be a long, drawn-out affair. Coca-Cola remains a brand powerhouse with nearly two dozen beverages that each generate $1 billion or more a year in revenue, and more than a baker's dozen waiting in the wings to join them. Even if it doesn't pursue a major shake-up like that envisioned by Wintergreen Advisers, Coca-Cola has the assets needed to keep driving sales and market share forward -- growth that could drive up the value of its stock.